Have you ever wondered how amazing it would it be if you could cook up a scrumptious meal in about 20 mins for the entire family on Christmas Eve dinner? Or how easy and hassle-free our lives will be if we could feed a dozen of people who are coming late in the party in another 20 mins effort? I’m sure most of you do just like me! And my staple Christmas dinner main, this One Pot Pasta with Mushroom and Sausage will do the trick for you too; just the same way it has been doing it for me for years now. This One Pot Pasta is a perfect life saver for me without any failure, ever. This has been my staple Christmas dinner main for past 3-4 years. Each time few people keep showing even after dinner spread is served which used to make me so frustrated that I had to order take away sometimes. So now I’ve settled down with this One Pot Pasta; it can be done within just 15-20 mins and comfortably capable to feed an entire football team. Not only on Christmas but also I cook this pasta dish almost once in a week. But I keep changing the ingredients and sauce time to time to avoid boredom. But the simplest thing is to throw everything you have in freezer in a large pan with pasta of your choice and water; now bring it to boil and that’s it; play with the seasoning and enjoy! Unbelievable, right? And top of that you can add protein of your choice; even it can be turned into vegetarian or vegan’s delight too. I’m just in love with it so deeply! Here is the ridiculously quick and easy recipe of One Pot Pasta with Mushroom & Sausage. Few strips of cooked Bacon. Start with chopping and cutting the veggies. Cut the cleaned button mushrooms into little thick slices or into quarters. Halve the tomatoes and olives. Cut the sausage into little thick roundels. Chop the parsley. Keep everything handy. Next, throwing everything in the pan. Take a large pan or dutchpan or crockpot or wonderpot whatever you can find handy. Heat the oil on high flame and sauté the garlic for 30 secs. now, the most fun part. Throw (literally) everything in the pot except olive and parsley. Add water and bring it to boil. Don’t forget to season with generous amount of salt. Leave the pan on high flame for next 8-10 mins or until most of the liquid is absorbed. If you prefer, dry up the entire liquid. Once done, add the olive & parsley into the pan and stir well. Switch off the flame. Voila! 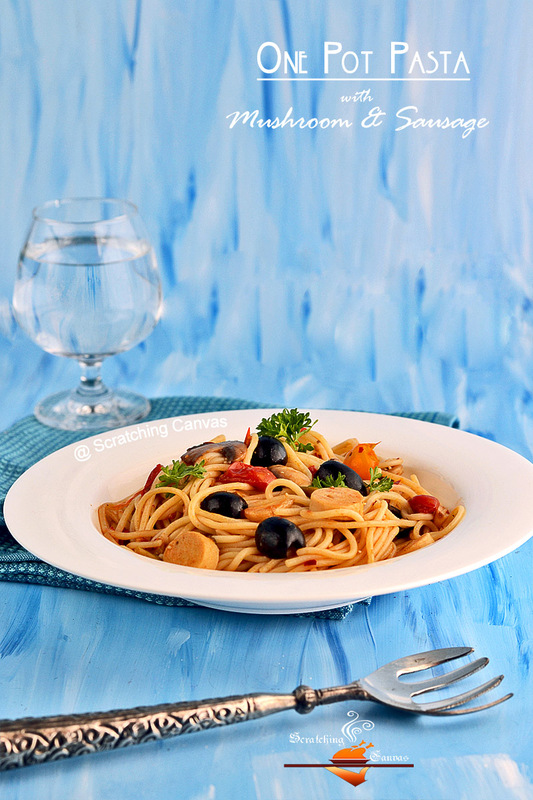 Delicious spaghetti in the pan is ready under 15 mins. Sprinkle some parmesan on top if you wish (I insist you do, please). Season with chili flakes or Italian herbs for spicier version. Transfer into serving bowls and serve immediately. Sometimes I prefer to add a tablespoon or two of my favorite DIY Marinanara Sauce. Or even if I’m in my luckiest day I would find leftover of my favorite Homemade Bolognese Sauce . in some corner of refrigerator and I top my pasta with it. Now, Dig into it. 1. Use any protein of your choice like diced chicken, shrimps, scampi etc. 2. Use shredded beef or pork to add meatier flavor in pasta. 3. Use any left over pasta sauce of your choice. I mostly use my Homemade Meaty Bolognese Sauce or Marinara Sauce. 4. Use some crunchy bacon on top to add some crispness to the dish.